Working in the leather business, it’s quite often assumed that we carry all kinds of finished leather goods, in addition to hides – “call the leather guy, I’m sure he has those leather _____”, and fill in the blank. Shoes, purses, technology accessories – we’ve been asked about all kinds of different finished leather goods, and had to direct people to other places, until recently. As a result of repeated inquiries over a period of time, we decided to investigate possible partnerships with leather good companies so that we didn’t have to turn these requests down. The tough part of this search was finding a company whose work we liked, and whose leather is held to the same kinds of quality standards as our own – not an easy feat. However, the first time we saw the work of Ricardo Camelo at Rical Leather Goods, we were sold. His bags and briefcases are of exceptional quality, expertly designed and crafted, and he’s had a successful business for over 30 years. With the trade laws loosening up between Canada, Columbia, and the U.S., it was the perfect time to form a partnership for the wider distribution of these great bags. These bags are perfect for those looking for a high quality gift that will last and be remembered. Corporate giveaways, complementary gifts for charitable donations – in any setting where quality leather is appreciated, these bags will be at home. The line includes briefcases, portfolios, messenger bags, luggage, backpacks, and more – you can view a complete catalog on our website, or get in touch for more information. We’re excited to continue this partnership and have the opportunity to offer our customers a more complete line of leather options. At DCT, we’ve had the privilege of supplying leather to some pretty interesting jobs. One such instance was back in the late 90’s, when the Wisconsin state government decided to renovate the interior of the capital building, and needed over 900 leather hides to complete the job. If you’ve ever been to Madison, you’ll know it’s nearly impossible to miss the gorgeous capitol building – it’s the architectural focal point of the city – and so we were proud to offer our services to help the interior match the level of quality seen on the outside. One interesting reason that DCT got the job was the size of our hides – some of the leather was used for the large seven or eight foot doors in the building, and the design on the upholstery favored larger hides, as they would mean less seams in the work. In addition to the size of the hides, the color of this particular job was custom. While DCT has a robust 140 color palette for our customers to choose from, but on orders over 30 hides, we also offer custom coloring options for larger orders. This is a function of the production size of our tannery – while it’s not possible to run one hide at a custom color, when the order is for more than 1500 ft2 of hide, the option to do a run in a unique color is a nice touch.renovate the interior of the capital building, and needed over 900 leather hides to complete the job. If you’ve ever been to Madison, you’ll know it’s nearly impossible to miss the gorgeous capitol building – it’s the architectural focal point of the city – and so we were proud to offer our services to help the interior match the level of quality seen on the outside. You may be wondering why we’re talking about a job that happened over 10 years ago, and we have two reasons: the first is that they were so happy with their order, they’ve recently put in a second supplemental order for more for another part of the building. Second, throughout the ten years and the process of this new order, we never had a service issue with the leather. This is remarkable, as the traffic in a public building tends to be higher than average, and yet still our leather was hardy enough to withstand the test of time, and still look great. We like history here at DCT, and when we have the opportunity to be a part of a project that has historical significance, we jump at the chance. 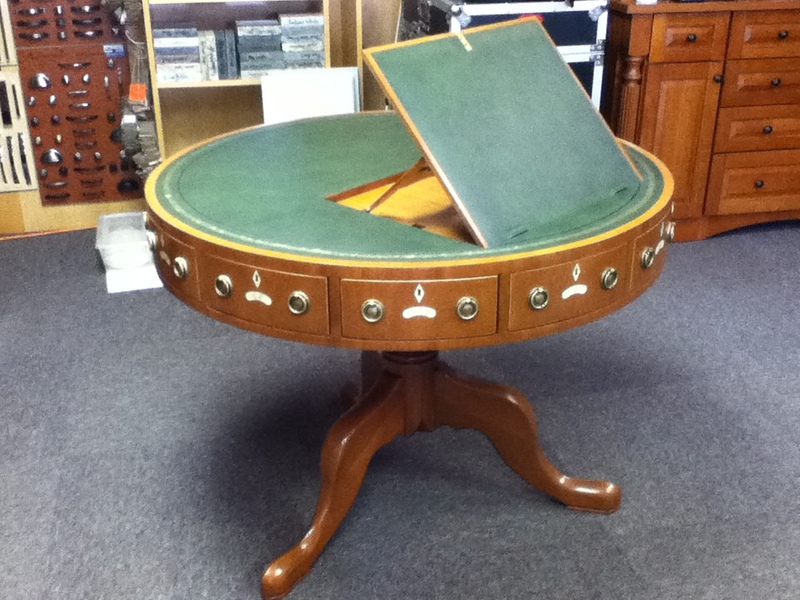 As many of our readers know, one of our areas of expertise is desktop leather, for antiques and custom furniture. These worlds collided when we were asked to supply the leather for a replica that was being built of the desk at which President Madison signed the Treaty of Ghent to end the War of 1812. Now if you remember from your high school history classes, the War of 1812, (also called the Second War of Independence) was fought between the U.S. and Great Britain, over trade, U.S. status as an independent nation, and U.S. expansion. The American/Canadian border was a place of much conflict throughout the war, both by land and water, on the Great Lakes. One particular battle in this war inspired Francis Scott Key to write what would later become the lyrics to the United States National anthem. Interestingly, both Canadians and the U.S. view the conflict positively – Canadians retained their borders despite U.S. invasion attempts, and the trade negotiations between the U.S. and Great Britain were ultimately resolved. While the resolution of the trade issues was largely a result of outcomes of the Napoleonic wars across the pond, U.S. independence was validated with the negotiations themselves, and ultimately with the Treaty of Ghent. The treaty was signed in the neutral city of Ghent in Belgium by diplomats in the final days of 1814, and ratified in February of 1815 by each government. It’s fitting that important documents are signed on nice pieces furniture (now the White House Museum has an entire room for it), and the desk we put our leather on was beautiful, and well crafted. It is now on tour as part of an effort to promote education about the War of 1812, and will most likely end up in D.C. as part of a permanent visitor installation – so the next time you decide to brush up on your Canadian and American History and take a tour of Washington D.C., be sure to go check out our handiwork, and maybe learn a little along the way! Many of us interact with leather on a daily basis, but have little idea as to the variety of terms and processes associated with the classification of its types, the nature of its manufacture, etc. Many products are branded with vague words like “bonded” (not actually leather, but a plastic-based leather composite) or “patent” leather (leather with heavy, rigid, high-gloss finish), and types like “suede” and “nubuck” are relatively well known, but perhaps confusing. We at DCT live and breathe all things leather, so we consider it a pleasure to inaugurate our readership into the language and culture of leather. Most of the terms you may come across in the leather business reference either where the leather comes from on the animal, or how it was processed to turn it into the end product. Leather “grain” refers to the visible texture of the leather, and is what gives leather its character. Each hide comes with its own unique grain that tells a story about the animal it protected – and bears the marks of scarring from other animals horns, barbed wire, or other sources of stress. An unaltered hide is referred to as a “full-grain” hide, as opposed to the more common “corrected grain” hides that are processed to hide the imperfections in the natural grain, and give a more uniform look to the leather. When leather is processed, it us usually split into several usable layers; the “top grain” and the “drop split”; the top-grain usually used for higher-end applications, and the drop split re-grained to get the classic leather look. Splitting is also how we get suede and nubuck, which are both sanded or buffed to get their velvety texture. Another term thrown around in the high-end leather world is “aniline”. An aniline dyed leather has been dyed all the way through for color, with no pigmentation or protection applied. Pure aniline leather isn’t produced anymore, due to health and safety risks associated with its dying process, not to mention its inferior lifespan and tendency to fade – the dyeing process has become increasingly regulated for those very reasons. What has replaced it now, though still only in high end applications, is “semi” or “protected” aniline, in which the hide has been safely dyed for color, and then given a small amount of pigment treatment to improve consistency and durability without compromising the look of the natural imperfections of the leather. If we’ve piqued your interest in the wide world of leather, don’t worry – there is a lot more to learn, and our glossary of terms is a good place to start. Let the leather learning continue! The craft of restoration has long enchanted the human consciousness. Whether a furniture maker hard at work in his shop, smoothing out the ageing curves of an old piece of furniture one more time, a cobbler methodically hammering and sewing a new sole onto an old leather shoe, or an auto mechanic, belly-up under the complexity of a rusty engine, there is an alluring element about the endeavor to make old things work like new; it fascinates people of all inclinations. Consider a recent example – the existence and success of TV shows like Fast N’ Loud, or American Restoration demonstrate this very idea. Call it reinventing the wheel, call it nostalgia – we like old things, but we want them to function like new things. Often, the reason behind this phenomenon is our notion that old things were made to more exacting standards, made to last in a way that perhaps has declined with the age of consumerism (or maybe we’re just viewing history through rose-colored glasses, but we’ll stop waxing philosophical now). The point is that certain things we buy and use on a regular basis, like furniture and cars, we like to keep around, and to do that we need to take the time to restore them to their former glory. For both of these particular items, that process of restoration usually involves a bit of upholstery work. Because of its associations with quality and longevity (think shoes, briefcases, etc), leather is most often the choice material for these upholstery jobs, and rightfully so. At DCT, we’re proud to play our part in the process of breathing new life into old things. Whether you find our leather in the interior of a luxury car, or on the surface of your newly re-finished desk, you know that what you just invested in is dependable, and timeless. Isn’t there a soothing, inherently comforting about the thought of an heirloom? Be it jewelry, art, or furniture—our personal favorite—something that’s been passed down through generations makes its owner feel that it’s special and unique. While you can easily purchase a new chair, desk, or sofa, a piece of heirloom furniture carries with it a history and a sense of family that you’ll never find in a store or catalog. By definition, an heirloom is an article that has been passed down for generations through family members. The word actually originates from old English, and in fact, throughout history English laws mandated the passage of these goods, and restricted their sale or inheritance to specific family members. While you may now be free to do what you wish with your heirlooms, the sentiment is still the same. Why do we hold on to these treasures, beyond the sake of sentimentality? If a piece of furniture has lasted through decades and generations, chances are it’s exceptionally made. We all know the saying, “they don’t make ‘em like they used to,” and we know the truth in it. Additionally, many of us are getting more and more into green living, and using heirloom furniture is really another form of recycling. Why buy a new piece, or throw away something old, when a little bit of TLC can breathe new life into that desk or chair and make it useful again? And, if it’s outdated, just get creative! That old leather desk top or chair could be new again by choosing from our range of leather upholstery hides in 8 categories of colors with 140 shades. Want something trendy and modern? Go for the au courant color, such as Emerald Green, chosen by the Pantone Color Institute as the color of 2013 (see our last blog post for more information). Do you have a favorite family heirloom? We’d love to hear all about it! Color Swatches: Should You Think Outside the Box? Sometimes the color of a piece of furniture or decorative item can go unnoticed, blending into the room and not particularly grabbing a single person’s attention. And, sometimes, that’s the aim; to create a functional and simple space. There are certainly practical considerations of choosing colors, but colors can also elicit emotional response and recall distinct memories. So, what does all this complexity mean for choosing the color of your upholstery? Understanding the emotion and dimension attached to color, DCT Leathers carries leather upholstery hides in 8 different categories of colors with 140 shades. The expansive choice allows the process to be personal. While there are common associations with colors that may be difficult to ignore, e.g. “red hot” or “ocean blue,” we’ve seen great customer satisfaction from choosing a color based on its personal meaning. Or from choosing to be unique – like a leading athletic fashion company choosing a unique hue of a bright color to upholster leather ottomans for shoppers to try on shoes. Our wide color selection can make bold statements, be geared toward practical considerations, and make memorable first impressions. Do you have a color story to share? We’d love to hear from you.